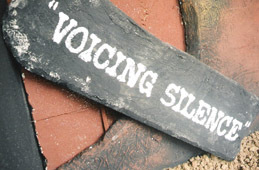 A Report "Voicing Silence 2004"
Seventeen documentary Films adhering to the theme of ‘Voicing Silence’ were screened at the fest over two days which was attended by hundreds of film buffs and enthusiasts. 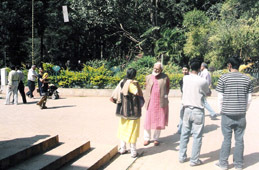 A wide coverage of the fest in the media/press had resulted in gathering of innumerable renowned filmmakers, who shared their views and points of view at an interaction with the present filmmakers from Malaysia and India. All the screenings were carefully witnessed with great attention, anguish and anticipation. Many of them in the audience were witnessed leaving reluctantly whenever there was an announcement for a short break in between the screenings. Film makers/audience seemed to have the full synopsis of the films prior hand before the screening of each film. 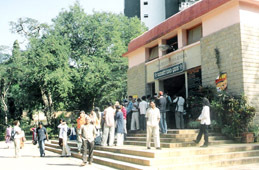 A comprehensive display of working stills, background of all the documentary films in the quadrangle of the venue was ubiquitous and informatory. A face to face with the Malaysian (Ms.Lydia and Mr.Ahmad) and Indian (Ms.T.Jayashree) film makers, post screening of their respective films gave the viewers an insight to the issues dealt in their films and an opportunity to interact with the people, resulting in a brainstorming session. The jury Mr. M.S.Satyu, a prolific film maker of international repute, at the end of the second day’s screening announced three best attempts that he would handpick among the seventeen documentaries showcased in the fest. The jury made it clear that though such films are not to be awarded by way of being judgmental, a pat on their backs for all the efforts that are put in for their visual ventures will boast their morale and encourage them for their next attempts. 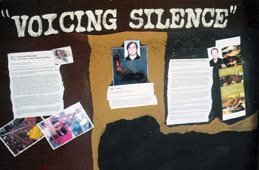 Adjudged as the first three best attempts in the “Voicing silence India 2004” are “Bagdad Rap” (Produced and Directed by Arturo Cisneros) from Spain, “People and Struggle of Fourth World War” (Directed by Marcelo Andrade Arreaza, Produced by Lino Andrade and Felipe Garcia) from Venezuela and “Are we Doing Enough” (Produced and Directed by Lydia Lubon and Ahmad Yazid) from Malaysia. The entire crowd congratulated the efforts of the rest of the films and expressed its solidarity to the organizers for creating a platform to ‘voice’ “silences”. 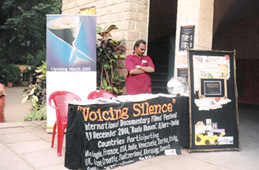 The organizers in return intended to make “Voicing Silence” an annual event with more such films to be showcased in the years to come. Molecules creations also announced the “US Docu. 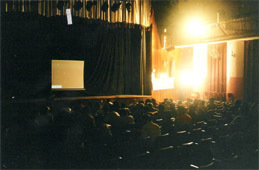 Films’ festival” in the month of February 2005. It also shared the happiness of traveling with Voicing Silence fest to various parts of the globe on an invitation from the interested authorities. Negotiations are on to have it organized in Bangkok, Malaysia, Serbia, Philippines and various parts of India. The event was culminated with a vote of thanks to all of them behind the scenes who made “voicing silence” possible. “PIZZA CORNER” and “THE CHANCERY HOTEL” supported the event.